You should also understand that we doing it not to make you redo the EA developments every time when we launching a new platform. From the beginning of Metatrader 5 development we thought that we will be able to save the compatibility. And we said about it many times. But the numerous traders/developers requests made us change our mind. We`ve understood that just cant make a new language compatible. At the same time we have made MQL5 more powerful and in this way we gave you, traders and developers, more abilities - that was our main goal in developing of MQL5 IDE. From one side new language with the new abilities and from the other side - MQL4 and MQL5 compatibility. Unfortunately, these two aims cant be reached at the same time. According to MetaQuotes, the MQL5 language is distinct for high speed of execution and approaches C++ in terms of this parameter. As compared to MQL4, the new language boasts up to 20 times faster execution speed. We know that execution speed is everything when developing ea's and scripts that sometimes need to crunch huge amounts of data in conjunction with real-time price movements. MQL5 is now more object oriented, what makes the development of EAs quicker, easier and more flexible, especially for autotrader developers. This also allows using more complex EA's able to process large amounts of data per time unit and therefore obtain more precise forecasts of price dynamics. The MQL5 programming environment incorporates intellisense system which, as most developers would agree, speeds up the development process. It also has a built-in debugger for testing and quickly find errors and fix them. The MetaTrader 5 Strategy Tester will not be much different from the tester in MT4 besides more advanced report system. "The MetaTrader 5 Strategy Tester will not be much different from the tester in MT4 besides more advanced report system." If this means no multiasset backtesting like in MT4, really sounds bleak. It will be multiasset testing one. You're very sure on yourself with this affirmation. If you're from MetaQuotes, this is realy releaving news. So is an MT5 backtest going to run 10 X faster than an MT4 backtest? 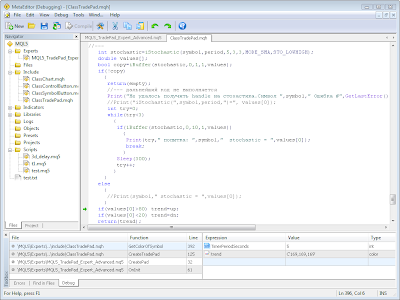 It looks that debugger works only with EA and scripts but not with indicators.